The most popular types of outboard engines these days are the four-stroke and the direct fuel-injection two-stroke. Both of these engines passed the strict regulations regarding the engine’s exhaust emission in the US and Europe. Boaters still debate the better choice, but ultimately, it’s a matter of preference. To help you figure out which outboard engine will serve you best, here is some information about each type, its pros and cons, top brands and everything else in between. The DFI two-stroke engine is known to burn oil more effectively. Unlike the carburetor two-stroke, there is no risk of losing 30% of the oil because the exhaust valve isn’t exposed when the fuel gets into the cylinder. The DFI two-stroke engine quickly responds when you throttle. This is ideal for water skiing and very helpful when you want to get ashore fast during bad weather. These outboard engines have been around since 1996 and are lighter than a four-stroke. Despite being dated, these engines are considered to have low emissions. Fishing trips involve cruising for long hours and this engine can handle the continuous stress because of its progressive power and torque. The cruise will be a smooth experience because adjustments in the throttle do not result in a burst of power from the engine. With proper maintenance, a four-stroke, whether it is DFI or not, saves up to 40% on fuel. You will notice this more when you run the boat on low rpm and even when it is high if you compare it with a traditional two-stroke. A four-stroke engine’s power phase is separated from the exhaust which makes the explosion almost inaudible. This feature is found DFI two-strokes as well, but others insist the four-stroke is quieter. The E-TEC DFI two-stroke outboard engines have power starting from 25 up to 300 hp. The latest E-TEC G2 series starts with 150 up to 300 hp and these are considered to be high powered and can handle multi-fuels. They also make four-stroke outboard engines with power starting at 3.5 up to 15 hp. The Tohatsu TLDI (Two-stroke Low-pressure Direct Injection) and DFI two-stroke outboards have low emission and are available in 40, 50, 90 and 155 hp. They also have four-stroke engines available in 2.5 up to 250 hp. They worked together with Honda to make the engines with power higher than 75 hp. Among the Chinese outboards sold in the country, Parsun’s carburetor two-strokes are the most popular. With the tightening of the regulations in July, it’s likely that not many of those will be available. However, the brand will still be on the market because they make low emission four-stroke outboards at 2.5 to 25 hp. Their four-stroke outboard engines have carburetor and EFI versions. These are available in 2.5 hp up to 225 hp. Three of their newly released lightweight 3.4 L V6 models begins with 175 hp up to 225 hp of power. They have high-power naturally aspirated four-stroke outboards called Verado with a power that starts with 135 hp. Also included in this is the 400R that’s used for racing. Mercury Marine also has DFI two-stroke outboards with the most popular (especially for fishermen) called Optimax available at 200, 225 and 250 hp and the ProXS Optimax at 150 and 250 hp. The F25, F60, F70, F90 and VMAX SHO 90 are some of the brand’s top sellers for their four-stroke mid-range lightweight outboard engine. The power starts at 2.5 up to a monstrous 350 hp V8. All in all, there are 30 models in this range and these can power for 4.2 to 5.2 m trailerboats. They’re the first to release low emission engines in the world and their BF4, BF45, BF175, BF200, BF225 and BF250 V6 models sold this year will feature this technology. 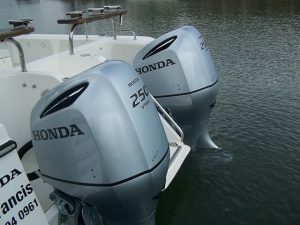 There are 20 four-stroke outboard engines from Honda and these will have 2.3 up to 250 hp of power. 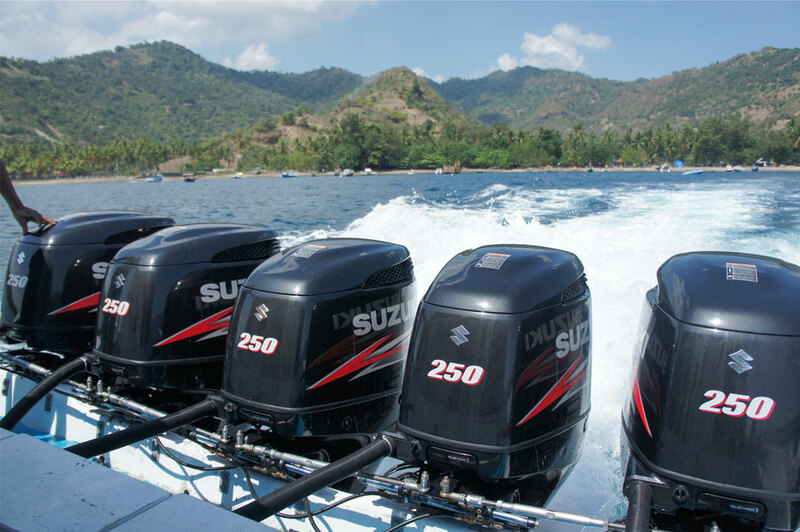 Their range of four-stroke outboard engines with power starting from 2.5 up to 350 hp have experienced good sales. One of their bestsellers is the DF350A with a contra-rotating propeller that improves the boat’s stability. One of the newest in their range, the DF325A, allows boaters to save on fuel costs because the engine runs on 91 octane fuels. Dinghies and other similar light boats usually require just a one-cylinder outboard. Not only that, 2 – 3.5 hp is enough to power it. If the boat can carry 100kg or is at least 20 feet big, then it needs around 4 to 6 hp while still requiring a single cylinder. Fishing boats and sailboats made of fibreglass or aluminium bigger than 14 feet will require an outboard with two cylinders. These boats have more technology because of their size and 8 to 20 hp would be enough to run it. Boats that can carry around 8 people will need a lot of power. Outboard engines with four to six cylinders and can reach 75 to 90 hp are needed to run these boats properly. Boaters should consider putting two outboard engines to power the boat for long fishing trips or going out in the sea. But these excursions require your outboards to have approximately 400 hp. You will have a spare in case of an engine breakdown. While it’s true attaching two motors can result in faster speeds, you have to consider its cost. Having two engines means you will have to maintain two. Not only that, the total amount of the two is more expensive. You need to make sure connections for both engines are separate. This means the power and fuel sources can still be accessed even when the other engine stopped working. Having this modification on your boat can cost you, but it’s not a bad precaution. Tip: Get yourself a satellite phone so you could always call for help even when you’re out in the water. A four-blade stainless steel propeller is a good choice for many boaters. Brand new outboards usually get a decent one so, there’s no need to replace it. But if you are keen on testing its performance, you can try to reach the engine’s maximum rpm and see if the prop lets the motor over-rev. If it does, it’s a sign it’ll cause friction which can damage your engine. You can also run the boat at a wide-open throttle to observe its pitch. If you’re buying a boat secondhand, you need to make sure you don’t get one with a damaged prop because that can cause your engine to break. The more you maintain your boat, the easier the process will be every time you do it. If you neglect it for a long time, it will find a way to get back to you by having an overheated engine, corrosion and, leaks. Here are some ways to prevent that. To prevent clogging, always check the hoses and fittings to see if it needs replacement. Always look for dings in the propeller. Depending on what you find, fix or buy a new one immediately. Avoid condensation by always keeping your fuel topped and always use a fuel stabilizer whenever you add new fuel. Looking To Buy A Boat? If the price is of the boat is holding you back from having nautical adventures, then you can contact Aussie Boat Loans for their finance options. They personalise loan packages so repayments aren’t a burden to borrowers. Call now on 1300 769 999 or submit an online application. Previous Previous post: Is This the World’s Most Expensive Yacht? Now that you know everything about outboard engines, you might feel that you need an upgrade for your boat! Don’t let finances hold you back. Contact Aussie Boat Loans today to help arrange a low-rate boat loan today.